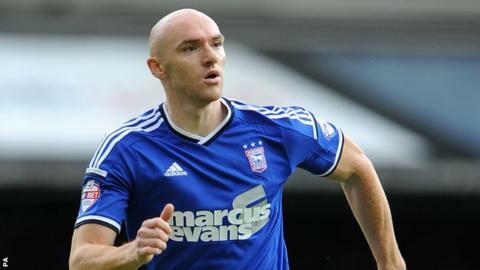 Ipswich Town striker Conor Sammon says he can continue to find the net this season after scoring his first goal for nine months. Sammon, on loan from Derby County, struck against his former club Wigan Athletic in Monday's 2-1 win. "I'm always critical of myself in terms of goals," he told BBC Radio Suffolk. "I believe I can score in every game I play in. I'm really confident that after getting my first, it can be the first of many." He added: "I feel I've got good quality and I'm playing with good quality players." Sammon had not been on target since firing a late winner in a 2-1 win for the Rams over Middlesbrough in December and finished last season with four goals in 44 games. The 27-year-old Republic of Ireland international joined Ipswich on a season-long loan in August and took six games to open his account. Town had to endure a late onslaught from the Latics but held on for a third successive victory to move up to seventh in the Championship. Mick McCarthy's team finished ninth last season, four points off the play-offs. "With the group of players we've got, the togetherness I've seen and the manager's attention to detail, there's no reason why we can't do well this season and finish even higher than last season," said Sammon.